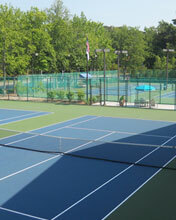 We are Sport Builders, a highly specialized tennis and basketball court contractor. We understand the game and the surfaces you play on. Although we primarily offer our services throughout the greater Philadelphia PA region, Sport Builders also builds, reconstructs, and resurfaces tennis courts throughout Connecticut, Delaware, Maryland, Pennsylvania, New Jersey and New York. We feature turn-key construction services for all-weather hard courts and Har-Tru® brand clay courts, but we also offer several advanced renovation options for older courts. The specialized processes and creative approaches we take to all our projects have earned us the distinction of being one of the top tennis court contracting companies. 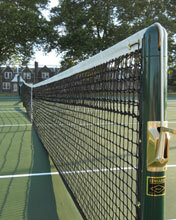 Cracked courts are the number one problem on all-weather hard courts. There’s a lot of information out there, look to us for an honest evaluation of your renovation options. The courts are too wet, too dry, too bumpy. We’ve heard it all and we have the answer. 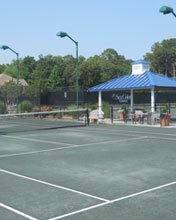 Clay courts are the best to play on, except when they are not performing up to member or player expectation. 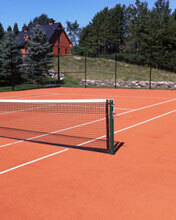 Transform aged hard courts and even older clay courts into a high-performance playing surface. There are several engineered synthetic court surfaces that play and feel like the “real thing,” while offering the low maintenance we all look for. Who doesn’t like to shoot hoops? 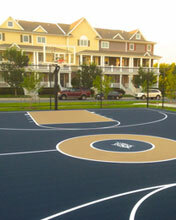 The custom high-performance basketball courts we build and surface are second to none. These are not plastic courts you see on the internet. Nets, windscreens, hitting walls, lighting systems, basketball systems and on-court seating solutions are just a few of the court enhancement products we sell and install it, too.